Everything exactly as you want it. What could be better? You choose exactly what goes into this fabulous collection. 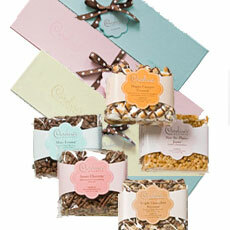 Choose the gift box and the four flavors that you desire. One - Pick the color of your gift box. Select from our traditional gift boxes in Pink, Lavender, Aqua, or Cream. A perfect gift or a splendid indulgence! Truly a singular experience just for you!